Chances are, you’ve heard the term design thinking before. The practice has emerged as an innovative tool for the progressive businessperson. But what exactly is design thinking? According to Sharon Kim, associate professor at the Johns Hopkins Carey Business School, design thinking is simply this: a new, better way to solve complex problems of all kinds. “Design thinking teaches you how to think differently when solving a problem; to take a more creative approach,” said Kim, who teaches design thinking at Carey. There are several elements that make up the design thinking process, but its fundamental philosophy is to conceive innovative solutions by zeroing in on a problem’s root causes. It accomplishes this through an iterative, methodical process that positions participants to think and act like a designer. The advantage, says Kim and other proponents, is that designers tend to approach problems from a more user-centric perspective. Think of any household product you use – say, a coffee mug – there’s no doubt it was designed with the end user in mind. In the design thinking world, this is called human-centered design. And it can be an incredibly powerful idea when applied to complex problem solving across all disciplines, but especially in business and health care. “Design thinking started in product design, but people are realizing this approach is applicable to all areas of business. We are seeing it resonate strongly in health care as well,” Kim said. So how exactly does design thinking work? Like any method, design thinking has a beginning and an end; however, unlike some others, it is a looping, iterative process – meaning participants are encouraged to revisit previous steps in the method several times through the process. It starts with understanding the problem. This is done through a variety of techniques, including creating a stakeholder map, which aims to identify the various constituencies affected by the issue. The next step is to observe the problem, an often overlooked element of problem solving. This is done to objectively view the issue at work. The hope here is an objective viewing will remove existing biases held either by the design thinker or the stakeholders. Next comes point of view – the subjective side of understanding. Here, design thinkers are challenged to examine the various viewpoints held by each stakeholder. Ultimately, these first three parts of the process are about creating empathy for the users within the problem solvers. 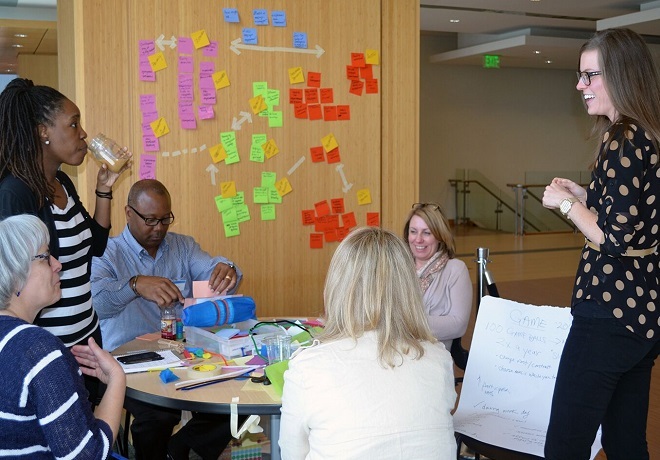 “Being aware what the thoughts and emotions are for the person that is using the product you are designing, that’s one of the most important elements,” said Kristin Holifield, an MBA student at Carey who completed the design thinking course. Seul Rhee, a Carey student who also took the course, agrees. “It helped me to see their point of view, and what the pain points are,” she said. Next comes the ideation phase. Notice how many steps lie before the solutions phase. Proponents of design thinking say often times people are eager to jump to solutions before they’ve fully grasped the problem. “It makes you more cognizant of not jumping to solutions; instead, taking the time to really understand what the problem is,” Holifield said. Once the ideation phase arrives, design thinkers are encouraged to “think outside the box,” way outside the box; so far outside the box you can’t even see it anymore. Following ideation is the prototyping phase, which is then followed by testing. Design thinkers employ a process called rapid prototyping, which Holifield says allows for key adjustments to be made on the fly. Both Holifield and Rhee are students in the Carey Business School and the Maryland Institute College of Art’s joint MBA/MA Design Leadership program. The innovative full-time, dual-degree program allows students to simultaneously earn an MBA from Carey and a Master of Arts from MICA. An integral part of that program is the design thinking course. “When I was looking for graduate school programs, I stumbled upon this concept of design thinking and creative intelligence, and I wanted to figure out which school offered a degree to learn more about this,” Rhee said. Kim said Carey hopes to offer more courses in design thinking (which is open to all Carey students), including an advanced class for students who have already taken the first offering. Carey also offers a three-day Executive Education course in design thinking for working professionals. Kim believes these factors, coupled with the school’s mission to teach business with humanity in mind, well-position Carey to emerge as a leading educator in the discipline. “Interest in design thinking has been growing steadily in the business world, and we are excited to see what creative contributions Carey students will add to this ongoing conversation,” Kim said.